As you all know we're always looking for great healthy recipes; and we really appreciate it when someone gives us one that is not only healthy but also tastes great. 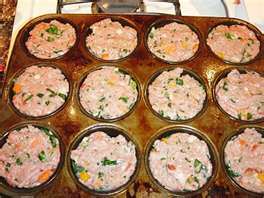 Christina one of our great Island Bootcampers gave us this recipe for Turkey Meatloaf in Individual Cups. It not only tastes great, is healthy, it's also easy to prepare. I especially like the left overs, they make great healthy sandwiches. Thanks Christina, keep the recipes coming. This ones fabulous.